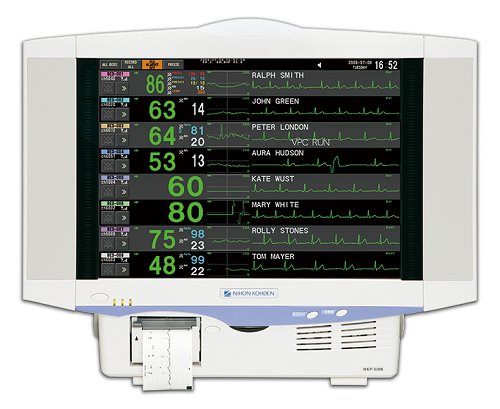 The CNS-6201 central monitor provides flexible and effective monitoring and review for an LS-NET patient monitoring network. Large, 24-inch LCD color flat panel touchscreen. Other displays can also be used. This is Japan’s best selling telemetry central monitor. This nurse oriented patient monitoring system is ideal for the step-down unit, ER, CCU and ICU, cardiac rehabilitation, general ward and other areas. A flexible choice of patient transmitters is available. There are two models, 4-patient WEP-5204 and 8-patient WEP-5208. You can configure the display depending on the room plan and patient management plan. It can be combined wirelessly with different types of transmitters or multi-parameter bedside monitors. One compact body contains the display with alarm indicator, main unit, receiving unit and built-in thermal recorder. You can install it on a cart to give the nursing staff even more flexibility. This is no alternative solution. If you install it on the nursing desk, you can add a second display. UHF digital telemetry with dual diversity antenna provides a reliable and stable signal. The frequency is different from wireless LAN, so there is no interference or data loss. 5 types of alarm notification, help ensure that caregivers don’t miss alarms. Nihon Kohden’s advanced ec1 arrhythmia analysis from our high end Life Scope J bedside monitor is also included in this central monitor. 96 hours of full disclosure ECG for all patients along with arrhythmia recall, trend, tabular trend and alarm history are standard.